Granted, this trip was with the family but hey, it was a relaxing getaway anyways! I think I ate guacamole and chips for lunch nearly every day and poolside lounging was the no. 1 priority. My parents even sat through a boring timeshare meeting so we could get this awesome zip lining trip. This is one of the most fun activities I’ve ever done! 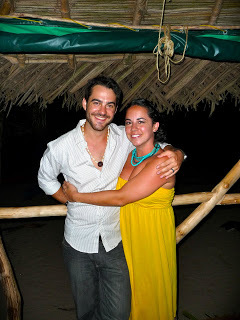 2010 was a big year of travel for us! 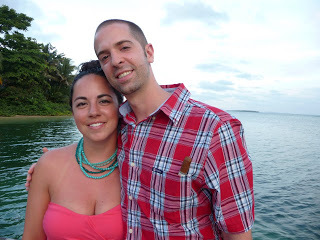 We got invited to a close friend’s wedding in Panama and made a week-long trip out of it. 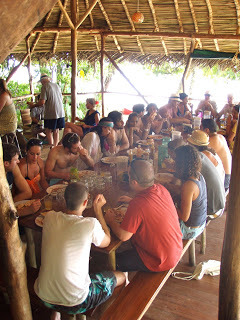 Guests came in from all over the world and it was a big party moving from hostel to hostel until we arrived at the Al Natural Resort for the wedding. I will never forget staying in these rustic, wall-less cabins overlooking the ocean. 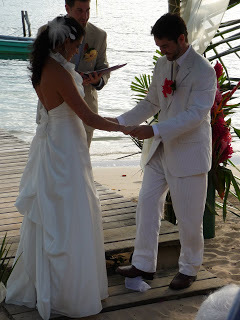 Oh, and that beautiful beach wedding! What can I say? I love me some Mexico! I found Tulum on a travel blog and those white, sandy beaches had me sold. We stayed in this funky little hotel right on the beach and spent our days swimming in cenotes and discovering the local ruins. I’d 100% go back to Tulum in a heartbeat! I even talked my parents into vacationing there this coming spring. I guess Austin isn’t exactly tropical, but it’s a warm destination compared to Seattle! We made a trip down south to visit our dear friends and take in Austin City Limits, our first major music festival. The beers flowed, BBQ consumed and the warm weather beat out those fall blues. What a cool, hip city to explore. 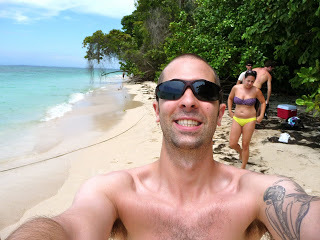 Oh Jamaica and your all-inclusive resorts! 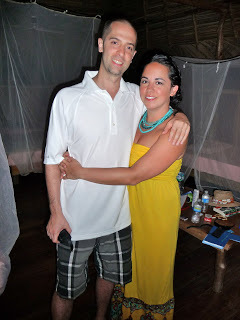 Honeymooning there was the ultimate treat for us and the perfect unwinding destination after a stressful wedding. We even extended our stay to come home post-Thanksgiving. It was just that good. Quiet beaches, friendly people and bottomless drinks…pure heaven! Ahhh….ceremony time! 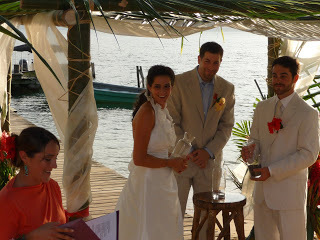 On Sunday afternoon, Aaron and Laura capped off our weekend with a beautiful outdoor ceremony on the dock of the resort. Unfortunatley, we had spent all morning out at the island, not realizing that we would be completely out of running water for showers when we came back. I had to use two bottles of water to try and get the sand off me – I still ended up going to the wedding with tons of sand in my hair!Laura was delivered to the dock by boat and walked down the dock with her father – she was stunning in a floor length, ruffled collar wedding dress! It was a wonderful ceremony with readings from both sides of the family, and Laura’s brother even officiated! After the glass was broken, we spent the rest of the night dancing on the beach under the stars. Couldn’t get any better than that! 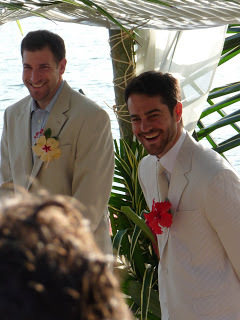 Photo: Me and the groom! Photo: The boys. 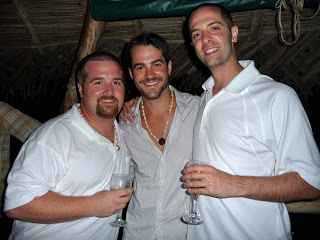 Photo: Adam and I getting ready for the dinner. 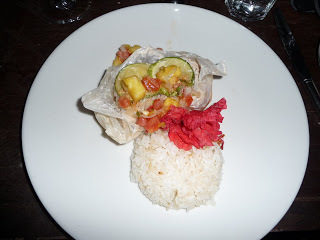 Photo: The main course – snapper! Photo: Lobster roll – drool. 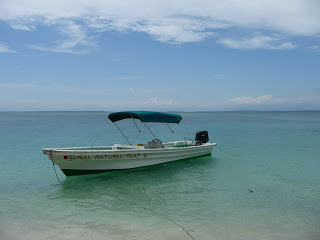 After a few days at the resort, we decided to hitch a ride over to the Zapatillas Island for the morning. 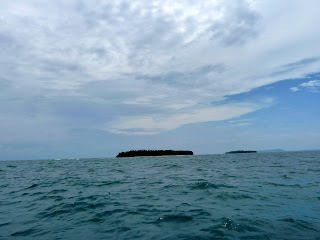 We were dropped off with a cooler and spent a few hours exploring the deserted island and swimming in the ocean. I attempted to snorkel, but didn’t see much. Luckily, there was plenty to see on land! 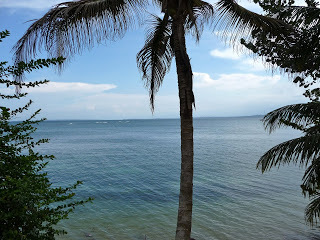 Photo: The view from our bungalow. 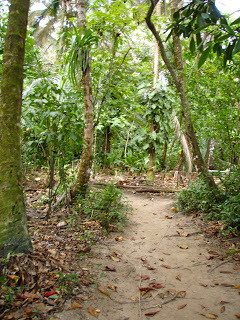 Photo: The path to the bungalow – through the jungle! Photo: Chillin’ on the dock. 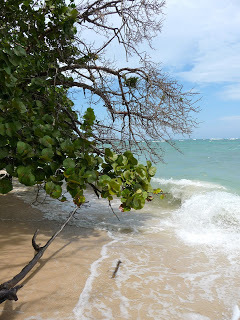 After 6 days exploring the cities and towns of Panama, we finally took our final bumpy boat ride to the resort where the wedding festivities would commence – Al Natural Resort! 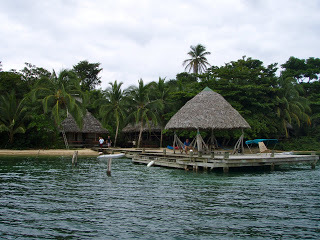 A 40 minute ride from Bocas, the eco-resort is on the tip of the island surrounded by that awesome bright blue water. 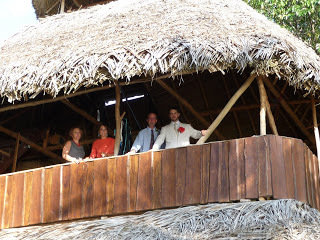 Adam, Dean, Zach and I shared the last bungalow on the line – a 5 minute trek through the jungle. 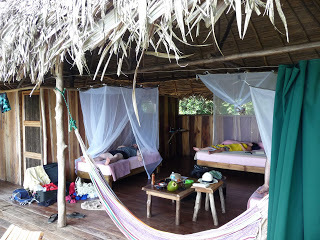 It was open to the ocean with a large deck, hammock and draped mosquito netted beds. It was like chic camping with a running toilet! 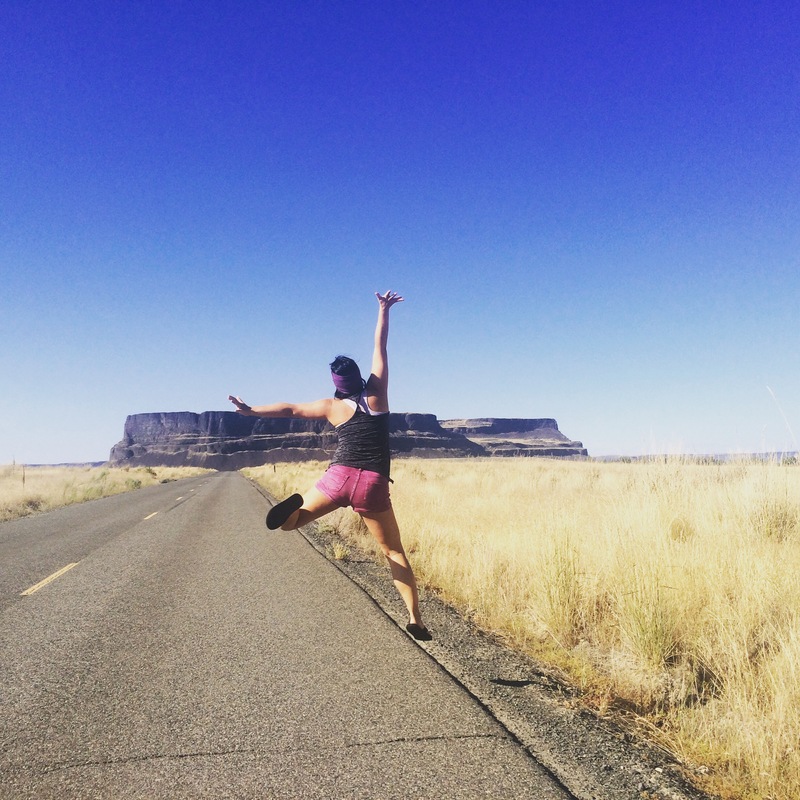 I was all about that – except for all of the bugs and lizards running around. So not a fan of those geckos. Ick. 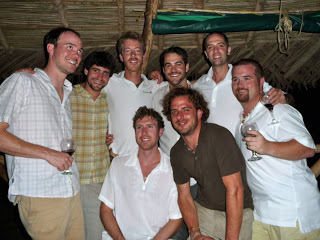 We got to meet everyone else in the wedding party, which totaled more than 50 close friends and family and spent the days swimming, sunbathing and exploring the island. 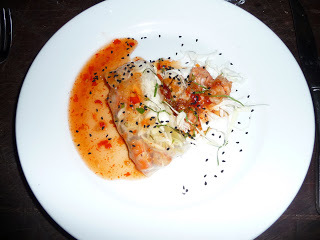 We also had all of our meals together – seriously some of the best food I’ve had in a long time! I think I could eat coconut for the rest of my life! Yum. After dinner dance parties, bonfires and boozing took us into the wee hours of the night; everyone was very excited for the wedding!